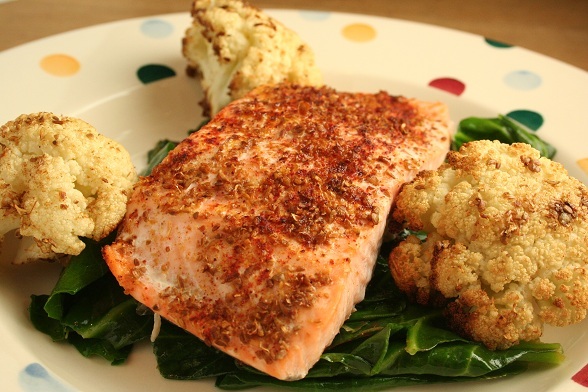 Salmon, cooked quickly with cumin, chilli, coriander and lemon (much like this recipe actually) and served with roasted cauliflower. The cauliflower just wouldn’t cook though, we ate it anyway but it was far too crunchy. Subscribe to comments with RSS	or TrackBack to 'Spiced Salmon'. Thanks for your blog and interesting dinner ideas! I don’t know how you do your cauliflower but you could try parboiling before roasting. I’ve done it that way sometimes and it definitely comes out softer.